A weekly newspaper’s chief reporter has celebrated 40 years with the same newspaper publisher. Gerry Warren, of the Kentish Gazette, has marked the milestone after spending four decades with the KM Group. Gerry, pictured, says he “fell into the job” aged 18 after being taken on as a trainee with the East Kent Times, in Ramsgate, with an £18 a week salary following a tip from a friend who worked there that they were hiring a junior reporter. 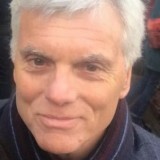 He joined the KM Group in 1978, initially on the Kentish Express, in Ashford, and later on Thanet Extra, but has spent the last 25 years with the Canterbury-based Gazette. In a piece marking his 40 years with KM for the Gazette, Gerry wrote: “Today’s leaner newsrooms contrast sharply to the numbers of reporters back then, when we even had a farming editor and someone specifically designated to put together the women’s page. “These roles have all largely gone on regional titles through financial necessity; now everybody has to do a bit of everything. Few jobs, I imagine, put you so uniquely in touch with all human life than being a newspaper reporter. He added: “It seems to me that the biggest challenge for journalists and newspapers today, in an age of rampant social media, is telling their readers something they don’t already know. Well done Gerry. A great achievement by one of the best local newspaper reporters who knows his patch inside and out.